Having thirteen yummy cake flavours on our menu to choose from can sometimes throw our lovely couples into a tizz!! For this reason we ask you to choose five flavours to sample when you come for your FREE wedding cake consultation. The trick is to pick your favourite five flavours first, we’re here to give guidance about which flavours to choose – I always tend to say pick a couple of your favourite flavours, a “safe” flavour that pretty much everyone likes, some sort of chocolate flavour (who doesn’t love chocolate cake, right?!) and then something a bit different; after all five different pieces is usually enough cake for any one person to try in one go! But…. if you’re still having a spot of bother picking your five… suffering from a bout of FOMO?… we’re more than happy to make up a sample box to take home with you of additional flavours at a cost of £2.50 per flavour. Let us know at the time of booking your cake consultation and we’ll prepare them in advance ready for you to take home. 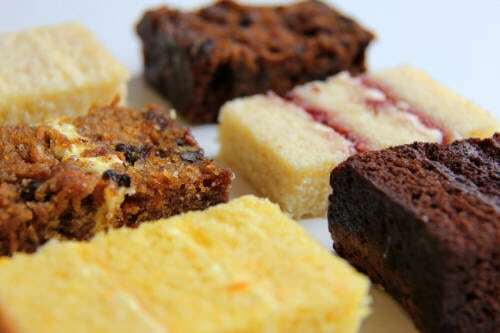 Right, I’m off to bake some deliciously, yummy cake samples..